Fitness and travel are not two words that you would put together, but I would like to think that they mesh together quite nicely. Before I get into my blog and my adventures, I think it is important to understand my motivations and why I love fitness and travel so much. I remember when I was 18 years old, I told my Mom and my brother, Zack, that I never wanted to leave the country again. My family had been on cruises to the Bahamas and I had done an exchange in Paris for two weeks when I was a freshman in high school, but I was against traveling. Fast forward 4 years, 30 countries later, and that is a completely different story. I thought that I had everything I needed here in the US. There was no reason, in my mind, to go abroad for an extended period of time and expand my horizons. Zack was a huge influence on me though. I remember looking at his pictures of him exploring Thailand in 2013 and I decided I wanted those same experiences. So in August 2014, we decided to do a backpacking trip for two weeks in Spain and Portugal. I was nervous to go and see a whole new culture that I had never been in before, but I was open minded and was ready for an adventure. It had to have been the fastest two weeks of my life and I hated leaving. To say I was hooked was an understatement. There was no going back. I loved everything about traveling. The people, the food, the cultural, the unknown… it was all exciting and invigorating. 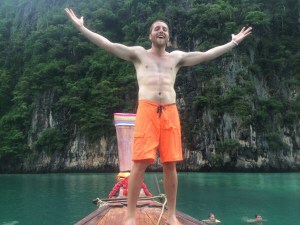 I’m on a boat… in Thailand! can only dream about and I do not take it for GRANTed (wow bad joke..) at all. questions or can relate to my story, I would be happy to share more information or talk about dealing with these issues because I have been there. I know what it is like to lose hope and lose yourself in the process. Overall, fitness and traveling are huge passions of mine. I look forward to sharing with you the knowledge I have accumulated and to show you that anything is possible with the right attitude, a game plan, and hard work. Keep calm and carryontravelfitness.